The rain came down heavy last week, bringing 6.5 inches to the farm on Tuesday and another inch or so in the days following. Many roads around the area were flooded and eroded, and many homes no doubt experienced some flooding and washouts of their own as well. With the soil fully saturated our fields were certainly as wet as can be, which is to be expected after receiving a couple month’s worth of rain in one day. (Grassed waterway channeling rainwater toward the woods, left). 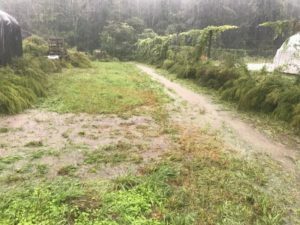 Heavy storms like this have become more frequent in recent years, and we have prepared to handle it with a few practices and land features to protect the soil and manage water flow. Keeping the soil continually covered with crops, cover crops and mulches are key to protecting the soil from erosion. Making our beds across the slope along the field contours slows the run of water downhill. Creating raised beds moves water away from our plants and allows the water to travel in the paths. Features like our contoured access road, water diversion swale and grassed waterway (pictured above) help direct water away from fields and towards our woods. So while we can’t control what weather receive, we are continually working to be prepared for whatever conditions come, protect our soil, protect our crops, and mitigate any potential damages. And though the fields are still wet today we have a harvest of winter squash, greens, scallions, tomatoes, eggplants and herbs to enjoy this week! 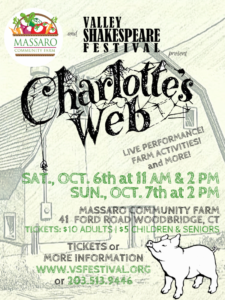 Only a few tickets remain for Charlotte’s Web, being performed here at Massaro by the Valley Shakespeare Festival this Saturday at 11am & 2pm, and Sunday at 2pm. Tickets: $10 adults, $5 Children and Seniors, Under 5 – Free! Weather-permitting, the performances will take place outside in the learning garden. 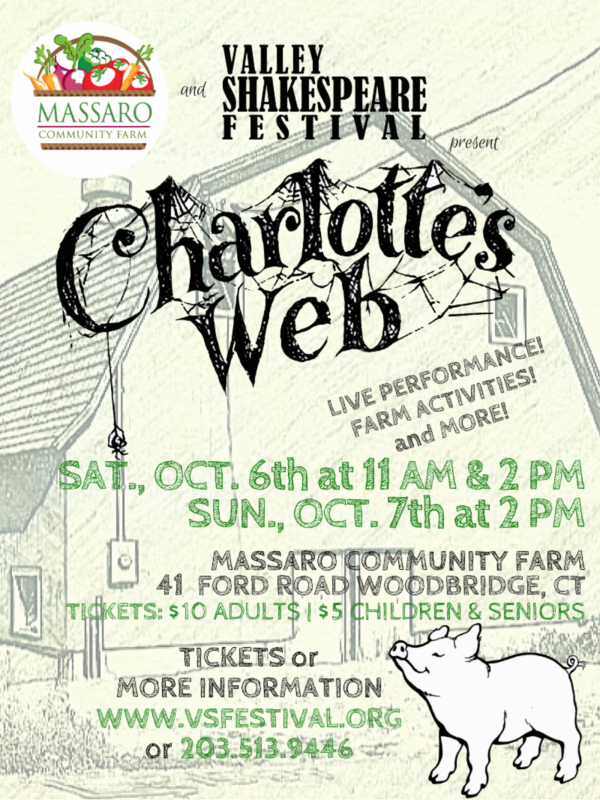 Join us at noon on Saturday for pumpkin painting and Sunday at 1pm for a scarecrow building contest.